"This is a wonderful family recipe I often make at Thanksgiving and Christmas." Preheat oven to 325 degrees F (165 degrees C). Coat a 13x9-inch baking dish with 1/4 cup melted butter. Pour half and half and milk over bread in a large mixing bowl; let soak for 10 minutes before gently stirring. Stir eggs into the bread mixture until incorporated. Add sugar, vanilla extract, cinnamon, and raisins respectively, stirring each addition into the mixture before adding the next. Spoon bread mixture into prepared baking dish. Bake in preheated oven until bread mixture is firm and pudding-like, about 50 minutes. Stir 1/2 pound unsalted butter, heavy cream, and brown sugar together in a heavy saucepan; bring to a boil. 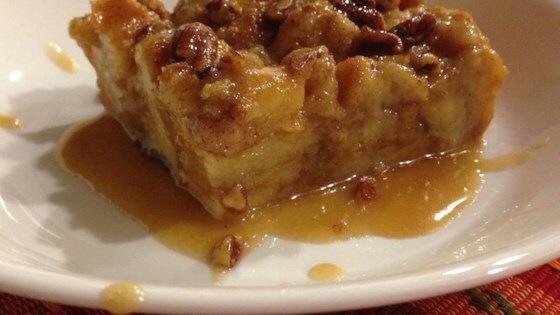 Reduce heat to low, stir pecans into the cream mixture, and simmer until the sugar is dissolved and the sauce thickens, about 5 minutes; pour over bread pudding to serve. This bread pudding is the best. I beat my my mothers recipe with this one.